M.A. Rosanoff: Mr. Edison, please tell me what laboratory rules you want me to observe. Edison: Hell! There ain’t no rules around here! We’re trying to accomplish somep’n. In Martin André Rosanoff, 'Edison in His Laboratory', Harper’s Magazine (Sep 1932), 403. I don’t know anything about mathematics; can’t even do proportion. But I can hire all the good mathematicians I need for fifteen dollars a week. 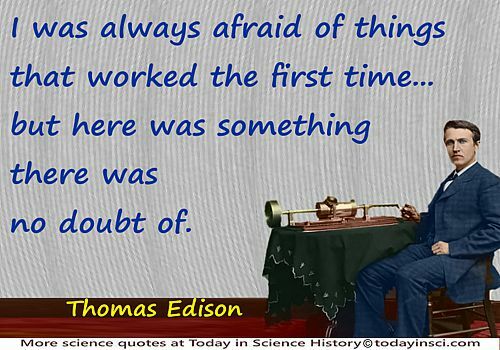 Quoted in Frank Lewis Dyer, Thomas Commerford Martin, Edison: His Life and Inventions (1910), 208. Oh these mathematicians make me tired! When you ask them to work out a sum they take a piece of paper, cover it with rows of A’s, B’s, and X's and Y’s … scatter a mess of flyspecks over them, and then give you an answer that’s all wrong! Matthew Josephson, Edison (1959), 283. In Dagobert David Runes (ed. ), The Diary and Sundry Observations of Thomas Alva Edison (1948), 110. Say I have lost all faith in patents, judges, and everything relating to patents. Seen in several books, attributed without citation, for example, in Ann Wimore, The Wheatgrass Book (1985). If you know a primary source, please contact Webmaster. Which do I consider my greatest invention? … I like the phonograph best … because I love music. And then it has brought so much joy into millions of homes all over this country, and, indeed, all over the world. “There is no expedient to which a man will not resort to avoid the real labor of thinking. 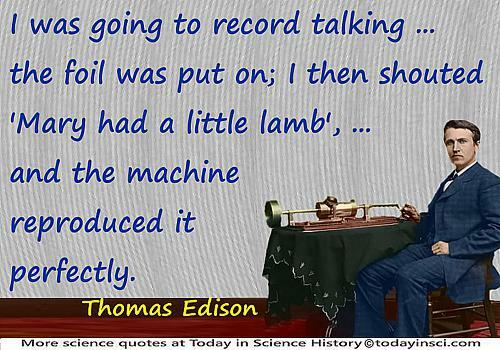 Mr Edison gave America just what was needed at that moment in history. They say that when people think of me, they think of my assembly line. 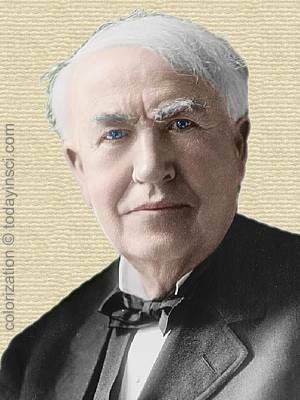 Mr. Edison, you built an assembly line which brought together the genius of invention, science and industry. Henry Ford in conversation Thomas Edison and Harvey Firestone (1931), quoted as a recollection of the author, in James Newton, Uncommon Friends: Life with Thomas Edison, Henry Ford, Harvey Firestone, Alexis Carrel & Charles Lindbergh (1987), 31. The quote is not cited from a print source. However, in the introduction the author said he “kept a diary in which I noted times and places, key phrases, and vivid impressions.” He also “relied on publications by and about my friends, which jogged my memory.”. Webmaster has found no earlier record of this quote, and thus suggests the author may have the gist of what Ford said, but is not quoting the exact words uttered by Ford, although quote marks are used to state Ford's remark. 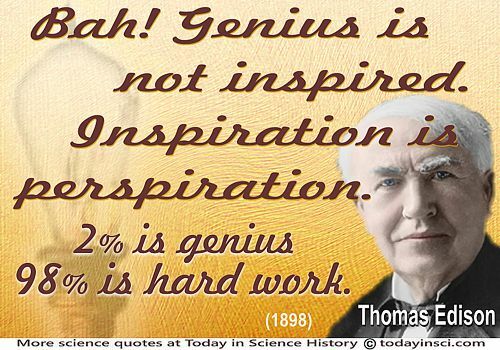 I’m one of those people that think Thomas Edison and the light bulb changed the world more than Karl Marx ever did. Expressing his reason for having no interest in a public sector role in politics. Interview with Rolling Stone writer, Steven Levy (late Nov 1983). As quoted in Nick Bilton, 'The 30-Year-Old Macintosh and a Lost Conversation With Steve Jobs' (24 Jan 2014), on New York Times blog web page. Levy appended a transcript of the interview to an updated Kindle version of his book, Insanely Great: The Life and Times of Macintosh, the Computer that Changed Everything. The way of pure research is opposed to all the copy-book maxims concerning the virtues of industry and a fixed purpose, and the evils of guessing, but it is damned useful when it comes off. It is the diametrical opposite of Edison’s reputed method of trying every conceivable expedient until he hit the right one. It requires, not diligence, but experience, information, and a good nose for the essence of a problem. Letter to Paul de Kruif (3 Aug 1933), as quoted in Nathan Reingold, Science in America: A Documentary History 1900-1939 (1981), 409.